Blood is made up of red cells, white cells, platelets and plasma. Plasma is the fluid part of the blood. Platelets are the smallest blood cells that circulate in your blood. Their best known function is involved clot formation, which controls bleeding at wound sites. What is not so well known is that they contain many bioactive factors that initiate and regulate wound healing. PRP is most commonly used for the treatment of diseased tendons, referred to as tendinitis or tendinopathy. Tendinitis/Tendinopathy can progress to a partial tear and if left untreated can turn into a complete tendon tear. PRP injections aim to stimulate the healing process by delivering platelets directly to the site of injury. PRP focuses on restoring normal tissue composition while avoiding further damage. PRP is good for helping injuries that may either heal on their own (given enough time) or are maybe stuck in the healing process and need a little “kick-start” to get the process back on the fast track. This treatment is not a ‘quick fix’ and is designed to promote long term healing. Patients who follow a course of physical therapy following PRP injection are likely to see the most improvement to the affected area. PRP has long been recognised as a potential expeditor of wound healing. Reports began appearing in the medical literature in the late 1980s and early 1990s where PRP was used in the surgical setting to enhance healing. The first reports involve orthopaedic, plastic and dental/facial bone surgery. The potential for enhanced healing in the sports injury setting was recognised in the early 2000s. More and more reports began appearing describing PRP use in the treatment of chronic tendon and ligament injuries. To ensure suitability for treatment, referrals will be checked by our radiologists. An ultrasound or MRI study would be needed prior to the injection to confirm the diagnosis, pinpoint the injection site, and to rule out any condition best treated surgically. Non steroidal anti-inflammatory medications (NSAIDs) – for example Nurofen, Voltaren, Mobic interfere with platelet function, and need to be stopped 7 days before and 7 days after this procedure. It is also advisable not to have had a corticosteroid injection in the 4 weeks before the PRP injection. Total appointment time will range from 30 to 45 minutes. 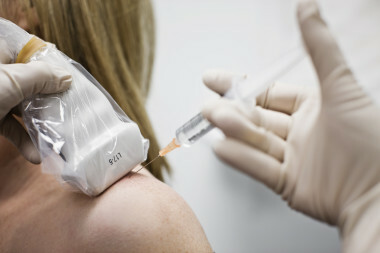 In most circumstances, 8ml of your blood will be collected from your arm in much the same way as a routine blood test. The blood is then spun in a centrifuge to separate the platelets from the red and white cells. The platelets suspended in plasma are withdrawn and readied for injection into the affected area. Following a local anaesthetic, the PRP will be injected, under image guidance, into the site of injury. Image guidance is important because it offers the very best chance that the PRP is delivered to the specific site of injury, where it can do the most good. Although uncommon these include those associated with any injection including pain, infection, skin bruising and discolouration, nerve injury, calcification and scarring. Please notify us of any allergies prior to the PRP injection. Call Perth Radiological Clinic or your referring practitioner, if pain persists or you develop any other adverse reaction. In the first week, a patients activities should be limited to those concerned with everyday living. Strenuous activities involving the treated region should be avoided. In weeks 2, 3 and 4 you are encouraged to gradually increase physical activities, preferably under the supervision of a physiotherapist who can create an individualised rehabilitation programme. If after 4 weeks your pain has reduced but still persists, or if there has been no noticeable change, you may wish to discuss with your practitioner a second PRP injection. For some patients it is only after the second injection, they get a desirable response.